My father-in-law passed away last week; he was 93 and lived a full, and most challenging life. A Holocaust survivor, he and my mother-in-law were spared by fleeing into the interior of Russia and surviving in the labor camps of Siberia and Khazakstan. His life reflected a commitment to hard work-he was a masterful tailor-simple pleasures of family and friends, and unswerving love of the Jewish people and Israel.He was the quintessential "zeide"-grandfather to his three adoring grand children and to any child who crossed his path. He shared over 70 years of devoted marriage to his wife from whom he was inseparable. Jewish tradition ordains a week long period of mourning -Shiva in Hebrew means seven-during which the mourners remain at home and essentially receive family and friends who comfort them and take care of all every-day necessities.This week is an opportunity to live through the intense feelings associated with the death of a loved one, hopefully leading to a fuller resolution of these feelings so that normal life can be resumed. It is also hectic and quite exhausting. We were blessed with the warmth, care and love of many friends and family members who provided food for all meals, visited and gave comfort and companionship during a time when one can experience great loneliness and a sense of abandonment. The appearance of co-workers reflected the esteem in which my wife and her brother were held in their places of work; family members coalesced into a unit of deeper intimacy that often only an occurrence of loss can generate. Past feelings of distance and alienation were suddenly set aside ,even erased as all those concerned rose to the challenge of bringing comfort to the bereaved. Somehow death is the great teacher of life's inestimable value and worth; somehow death touches the human heart so that it may embrace the fullness and beauty of all things; somehow death connects us to the imperishable reservoirs of love and deeper understanding. I am grateful for the shiva period that enlightened me so deeply regarding the preciousness of wife and children, and how fully blessed I really am. May the memory of my father-in-law, Jacob Lederman, Yaakov ben Ze'ev Halevi, always be a blessing. She was 96 years old. I approached her bed and introduced myself and my son Jeremiah, explaining that we had come to sound the Shofar for her, if she wished, and to bring her New Year greetings. She was blind but her eyes filled with light. "How happy I am ; happy New year to you; you should have a healthy and happy New Year! " she exclaimed excitedly. Facing my son she said without seeing him: "Remember that when you are little love seems tiny; but love is bigger than the whole world!" Her worn and wrinkled face radiated joy and tenderness, and my heart was filled with the sweetness of this woman's holy presence. We continued to another hospital room where we found a 94 year old woman at whose bedside sat her devoted daughter. She informed her mother of our presence and when she heard that my son was with me she proceeded to quote Shakespeare:"Sharper than a serpent's tongue are the words of a thankless child" -and continued to recite a soliloquy from Hamlet. " I remember these words from when I attended college over 70 years ago, majoring in English." We exchanged New Year greetings, sounded the piercing notes of the Shofar and left. What a moment of holiday inspiration. I attended a remarkable service at Romemu-a spiritual renewal synagogue in Manhattan, and derived much gratefulness from the spirited enthusiasm and open hearted ness of the rabbi and all the congregation's participants. It was indeed an uplifting experience. But my heart was most deeply touched in the quiet encounter with the two elderly ladies in their hospital beds. 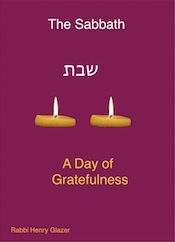 I realized again that the greatest gift I received this Rosh Hashanah for which I was most deeply grateful was the gift of gratitude shared by those alone and infirm on a festival day. I certainly received so much more than I gave. It is the tradition of the Jewish people to mark the beginning of a New Year by engaging in a process of conscious introspection about the year that has passed and consider ways by which to enhance and improve our lives spiritually in the year ahead. This is no easy task and most of us can only pay lip service to this opportunity for change in our lives. So much happens, there seems to be so much that requires change, so much that we are unhappy about! Where do we start? What kind of steps can we take that allow for success and not create the inevitable sense of failure because of being overwhelmed by the enormity of the task? 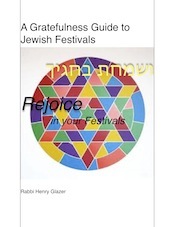 Rabbis and preachers around the world will be addressing this question in the hope of offering guidance to our people to take at least some necessary steps toward a life of greater fulfillment and joy in the New Year. Allow me to add a modest recommendation and clear-sighted direction as we hopefully move forward along the path of greater spiritual growth in the days ahead. of my journey toward greater meaning, wonder and compassion in life.When feelings of anger, disappointment, envy and discontent fill my heart, I know it is time to introspect, re-evaluate and meditate on the richness of gratefulness as a source of my personal joy and fulfillment. It is time to refocus my spiritual lens and gain a clarity about my life that is perceived only through the prism of gratefulness , thankfulness and the ability to praise. rather than becoming mired in guilt, self-doubt , and cynical rage, my urging for all of us-myself included-is to pursue the path of gratitude in the New Year, and with a sense of gratefulness for all of life's gifts and blessings be energized to respond to all of life with more generosity and kindness, more compassion and love. May we all be inscribed in the book of life; may we all author best sellers on the theme of gratefulness and goodness, so that the world be rewarded with its most cherished of all prizes, the prize of peace. Amen. My family has just celebrated my son's 27th birthday. It was modest and lovely, and satisfied his expectations.Needless to say, we were all grateful. Yet, curiously, I found it difficult to fully enter into the awareness of gratitude. It remained a cerebral consciousness rather than one deeply felt. After much thought and contemplation it occurred to me that perhaps our difficulty with feeling grateful has less to do with not having enough and more to do with having too much, and not being able to properly register or spiritually ingest the fullness and totality of all the gifts bestowed upon us. Never could we fully state our gratitude..."
The spiritual challenge remains, on every birthday and special occasion and in fact on every day of our lives to pause and peer into the mystery and wonder of being alive and allowing our hearts to say thank you. Thank you for the countless blessings in my son's 27 years of life. GRATEFUL FOR MY "MINYAN BUDDIES"
It became evident to me this morning that I had omitted another important reason for gratitude associated with the "minyan." Usually, at the conclusion of the service, its members dash away to work or to other required destinations. 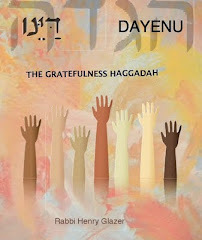 Occasionally, a few linger.This morning I stayed behind and together with humorous and witty exchanges with some of my "buddies" I asked my professor "Buddy" for some suggestions regarding my work on a Passover Haggadah whose theme is that of gratefulness.In the course of our discussion I grew excited and re-energized: new and creative ideas filled the quiet of the early morning and i realized how grateful I am to have at my fingertips such a wealth of human knowledge, wisdom and creativity. How reassuring it was to know that in the event of some personal or professional challenge or difficulty, the "Minyan'" encompasses resources of such extraordinary value and assistance. I thank my "buddies" for their interest, their support and their many wonderful suggestions.Indeed, it takes a "minyan" to raise not only a child but an adult as well. We parted with the Yiddish words echoing in my ears: "a gebensched tog"-have a blessed day. It certainly started off that way! 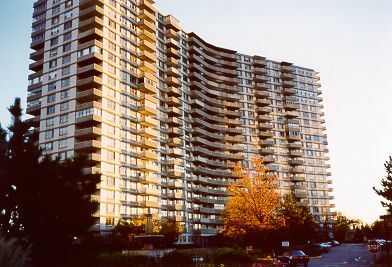 rationale was a financial one-why invest in a rental apartment and get nothing lasting in return! The co-op provided some equity for ourselves and our children.Today I discovered a more profound and meaningful reason for becoming part of a co-op arrangement ,if, of course, one has the means to do so. I just returned from a funeral; the deceased was an elderly gentleman who would exercise in our modest gym almost daily.He always greeted me with glowing eyes and a bright smile, even when his health was failing and the regular exercise routine became too strenuous for him.Irving was always smiling, good-humored, kind and soft-spoken, surrounded by an aura of innate gentleness. At the funeral, friends and neighbors spoke words of eulogy together with the rabbi and Irving's children. it is a community of people who can evolve into close friends and become virtual members of one's family. As I listened to words of gratitude , sadness and love, I realized what a blessing this community is to so many of its members; how important a role it plays in transforming one's final days into moments of delight , companionship and meaning. I understood how grateful I could be for this gift, in spite of the downturn in the real estate economy which made for significant losses in the value of each apartment. There was only the increased value to the human benefit of being part of this community, a benefit beyond the measurement of money. It was a sad day for all of us; but in the midst of the darkness of this day I caught a glimmer of light that reflected a source of goodness and gratitude , the light of this kind, gentle man and the light of a caring community. I spryly climbed the stairs to the synagogue making my way to the early morning minyan, the quorum needed for communal prayer. Rousing me from traces of sleep was a symphony of twittering cascading into my ears from the treetops above. 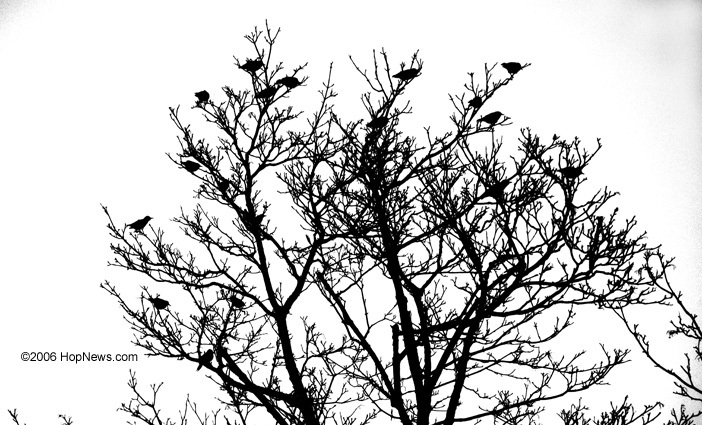 Wild sounds, chaotic chirping, a cacophony of shrill chirping filled the misty morning air. I looked up and the branches were laden with fluttering creatures, abuzz with excited movement, as if declaring to the skies: "We are thrilled to be back-it has been a long cold winter and now we eagerly await the warmth and sunshine of spring!" I too greeted them with a smile and a feeling of gratitude that their return signaled the imminent return of days without heavy coats, gloves and scarves wrapped around reddened ears. "Modeh ani lefanehcha"-"I thank You for the new day, a day begun with birds' blessings and praise." I stepped into the synagogue, ready to pray. GRATEFUL FOR BEING WITHOUT WATER?? My fellow residents were not terribly happy this morning. They stood in the elevator in angry silence, self-conscious , receding into the elevator walls; the elevator filled with the fragrances of pungent perfumes and body lotions; it was Monday morning that only partially explained our sullenness.We were without water-the weather had battered several surrounding communities in Northern New Jersey and the New York area, toppling trees, damaging water stations , downing electrical lines and crushing innocent lives within a few unlucky seconds of life's unexplainable randomness. Bodies unwashed, teeth un brushed, toilets un flushed-nothing to be grateful for. I cannot count the number of times I unconsciously turned on the tap, with the sudden awareness of no water . People dashed to super markets and convenient stores only to breathlessly discover shelves bare of bottled water. I returned to the elevator.This time, my fellow residents seemed more jovial; the "crisis" created responses of joviality and sharing.Instead of sullen silence, people joked and laughed. It was good to witness such good naturedness. As time went on, we came closer to the promised time of restored water flow. This too buoyed our moods. convenience of having water arrive at my finger tips without lifting a finger.Unlike the millions of others who walk miles with jars on shoulders or jerrycans in hand to depleted and muddy ponds of water , and for whom places of bodily excretions are located in outdoor spots that harbor minimal privacy, we are blessed with PS&G or CON EDISON, with an advanced and efficient technology and government that shower the gift of water upon us each day, no matter how wet or dry the streets outside. Today is a good day to again say thank you; adults may need some encouragement; not children who once again can remain in bed snuggled under warm blankets and day dream of TV shows yet to be watched, and friends with whom to hang out all day. All schools were closed -what a gift! I have just returned from Grand Rapids, Michigan, where I was warmly hosted by a colleague and his remarkable family for a weekend experience of sharing my thoughts about gratefulness as a spiritual path. Grand Rapids is a small Jewish community but what it does not have in numbers it certainly more than makes up for in warmth, generosity, dedication and genuine commitment to Judaism. I was invited to teach but in fact it turned out that I was the student. At each occasion of this kind, I discover that people of all walks of life, of varying ages and experiences, emerge as sources of enriching and inspirational insights and ideas. As they honestly share their struggles with becoming more grateful and how it impacts on their lives, I gain a deeper and broader clarity of gratefulness' depth and scope for myself and as a concept shared by others. Friday night I spoke of the meaning of gratefulness and pointed out its origin in the word-grates-which suggests something we receive freely, namely our very lives. One woman approached me and excitedly indicated that not only is gratefulness a response for receiving something free, but it is an approach to life that makes us free. In other words, the way to freedom is the way of gratefulness. She feels freer each time she is in touch with her ability to feel grateful for her life. Of course I could not help but appreciate that insight in light of the rapid approach of Passover, the season of our freedom. The gratitude of others elicited my own sense of gratitude and I came to learn how infectious gratefulness can be and the blessing it could bring to others. 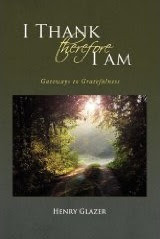 In the spirit of gratefulness I extend myself freely to have conversations with others about this vital spiritual idea. Invariably, I am handsomely rewarded with deepened levels of gratitude for the privilege of enriching the lives of others. Thank you Grand Rapids-Blessings for abundant gratefulness in the future. We are finally digging out! After record breaking snow-fall for the New York area, the roads are passable, electricity has been restored ,we can once again catch sight of the rooftops our our cars, and the economy which lost billions of dollars in non-productivity is humming once again. And of course, to the great delight of parents, children have returned to school. The weather is a phenomenon of nature that is inevitable, over which we have no control. We can anticipate it, we can prepare for it; we can't stop it! But we can cultivate an inner attitude toward what it is and how it affects are lives. The snow storm brought much suffering to many. People lost their lives, income, and budget commitments.Dangerous roads and sidewalks caused innumerable accidents; the homeless and unprotected shivered in the snow's wetness, and dreamed of sunny days when the sun's warming rays would once again be free for all to bask in. On the surface, there was not much to be grateful for. Yet, what stands out in my memory of this unusual event are recollections that do in fact elicit a deep sense of gratitude for this wonderful gift of nature. The sheer and utter glee of children being informed that the following day school would be closed rang out like the peals of the liberty bell throughout the hallways of my apartment building; the hundreds of children transported to a fairy land of pure white joy, sliding and skating and romping in the snow , filled my heart with a lightness of being that swept away the coldness of the wintry air. The innumerable kindnesses and courtesies that I encountered reminded me of the basic goodness of people; and the beauty of white's purifying power as the world took comfort and refuge under a blanket of silken flakes, allowed us to hear winter's symphony , the silence of our own pure souls. In three weeks spring will officially arrive; until then, we will wind our ways through slush, water and mud. White will wash away into shades of brown and gray, until finally the world will explode into a rainbow of colors bringing the message of renewed life and new awakening. For all of the shades of life, for an-ever changing world of unexpected surprises and unfortold phenomena, we open our hearts and greet it all with "thank you." Four years ago I ran the New York City marathon. I was one of 37,000 people running a distance of over 26 miles in a little more than five hours. Yesterday, I experienced a different kind of marathon; I was one of sixteen people whose journey didn't take them along the streets of New York but instead covered the physical space of several square feet of one lovely apartment on the Upper West side but whose spiritual distance was an unending path leading to the greater depth of Jewish spirituality. We didn't use our bodies but our minds, hearts and souls. 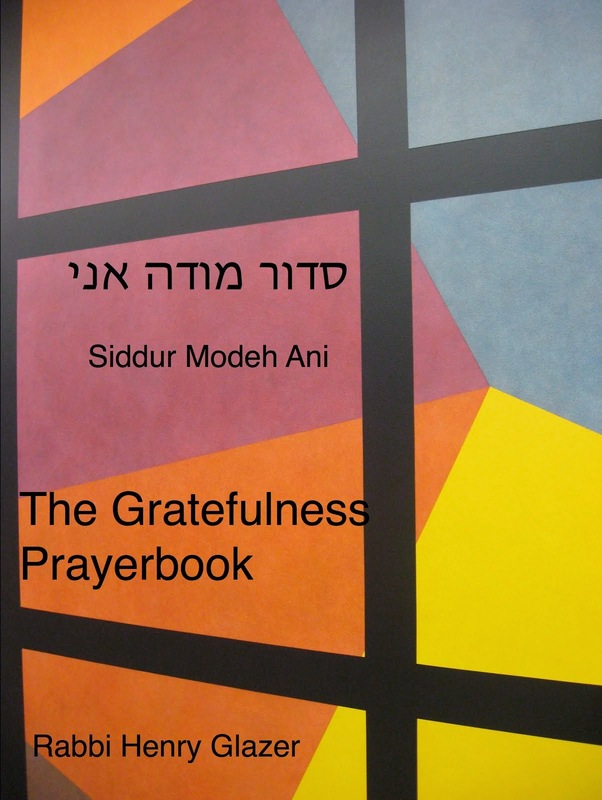 It was an all-day marathon in Hebrew Literacy, a run towards the ability to read the prayers of the Jewish people in the language of our Torah, Siddur and religious writings. We began, as I did before the NYC marathon with the blessing of "Shehecheyanu," thanking God for the privilege of engaging in this journey. For me, the day was one of utter gratefulness . The reasons are many; we were hosted by a most loving and generous individual whose wonderful apartment pulsated with loving energy that enhanced our capacity to move forward the entire day; we were blessed with the constant presence and open-hearted availability of our facilitator who willingly and good-naturedly ran around making sure that we had sufficient copies of our text and delicious food for our lunch and did so always with a smile; in spite of 9 hours of rote-like review of alien letters and words which demanded the gruelling exercise of memorization and an inexhaustible source of patience and support, never for a moment did any one of us experience impatience, hostility or complaints from any of the participants;rather, the room radiated with an an uninterrupted flow of support, genuine caring and concern, and an awful lot of laughter, humor and refreshing fun. Unlike the end of the running marathon at which point I felt completely exhausted and depleted, somehow I was able to maintain an unusually high level of buoyancy and energy until the very last words of our Hebrew review.Perhaps our greatest joy arrived when for the first time in our lives we were able to correctly read a full Hebrew word. As adults who missed such opportunities of learning for so many different reasons, the past, with its discomfort and feelings of alienation was washed away by the gentle and nurturing waters of recognition and awareness in the community of loving companions.Finally ,the treasure of Jewish worship and prayer could be touched with more understanding and open hearted familiarity. Four years ago, when I crossed the finish line , I recited the traditional blessing -"Hatov v'Hameyteev" - I thank You,Source of the Good, for allowing us to share in Your goodness and beneficence. Yesterday, at five o'clock in the afternoon, at the end of this extraordinary day of gratefulness,the words of this blessing echoed through the hearts of all my fellow runners. We made it. Halleluyah. PS When we came to the Hebrew word -ROMMEMU-and read it successfully, we all exploded into an ear-splitting response of applause, shouting and laughter.